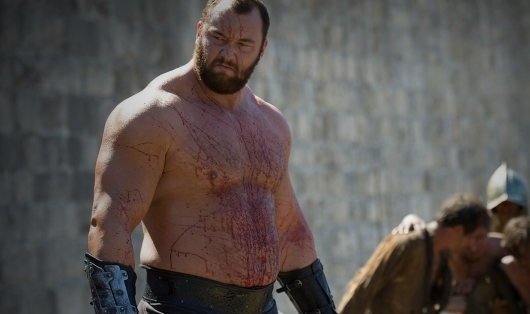 We already know that Hafthor Bjornsson, the Icelandic giant who plays The Mountain on HBO’s Game of Thrones, is a monster of a man. We also know he can be good with kids and lift a whole lot of weight. Now, Bjornsson is breaking a 1,000-year-old Viking weightlifting record. Though “record” may be the wrong word, as it sounds more like he took on the challenge left by an old fable. While competing in the World’s Strongest Viking competition—which he won for the second time in a row—Hafthor basically carried a tree on his back that weighed in at 650 kg (over 1,400 pounds) and measured 10 m long (almost 33 feet) for five steps, besting the millennium-old legend’s three steps taken by Ormur Stórólfsson. You can read more and see the latest feat of strength accomplished by The Mountain that Rides in the video here below, as well as an image that shows just how large the log was.